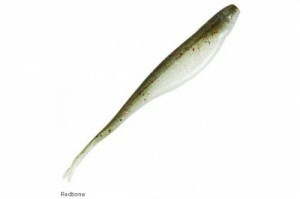 A super-lifelike, salt-impregnated soft jerkbait with a lively, split-tail design that perfectly emulates erratic baitfish action, Jerk ShadZ can be rigged weightless to achieve a slow, flutter presentation, or bottom bounced on a weighted hook or jighead. 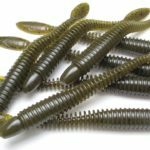 The 5″ Jerk ShadZ is ideal for popular inshore targets like redfish, seatrout, flounder, and snook, while freshwater bass anglers have found it to be effective as both a surface twitchbait for largemouth and a drop-shot bait for outsized smallmouth. 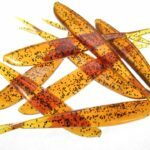 An upsized version of its 5″ little brother, the 7″ Jerk ShadZ is a deadly search and reaction bait for stripers, bull reds, snook, tarpon, cobia, pike, and musky. 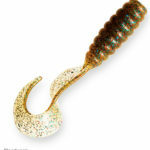 Both size Jerk ShadZ are also incredibly effective when pinned to a heavy jighead and jigged vertically for grouper, snapper, amberjack, and yellowtail, where they not only trigger violent strikes but also hold up to constant abuse from bait-stealers like no other scented soft plastics on the market!